The first song of Deepika Padukone's much-awaited film, "Finding Fanny" is released. The song titled "Fanny Re" features all the main characters of the comedy flick, including Arjun Kapoor, Padukone, Naseeruddin Shah, Pankaj Kapur and Dimple Kapadia. The track appears quite quirky with all the actors dancing crazily to the funny beat. It has been composed by Mathias Duplessy, and sung by Mukhtiyar Ali. The video is choreographed by popular dance master Shiamak Davar. "I told Shiamak to stay true to the tone of the film and even showed him a few scenes. He laughed, saying he wouldn't have to do anything. It was a reunion of sorts for the cast. I can't get over Dimple's frenzied 'prosthetic' bum shake move!" director, Homi Adajania told The Times of India. "It was fun choreographing the video as I wanted to bring out each character's personality." added Davar. Padukone looks stunning in the video with a cropped top and a skirt, showing off some crazy moves, while the rest of the cast are seen singing and dancing wildly on a Christmas eve party. However, it is Kapadia who steals the show in the video with her 'prosthetic' bum shake move. 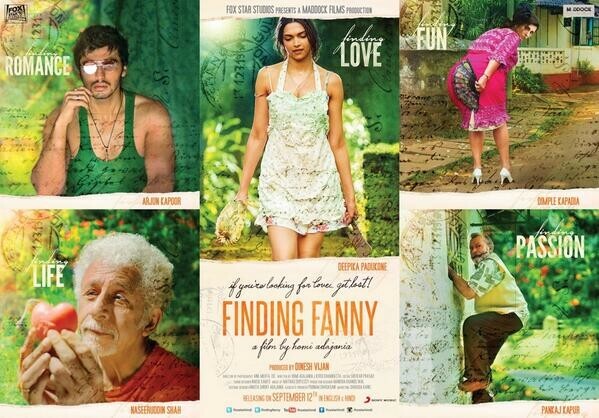 Adajania's "Finding Fanny" is an unusual story of 5 'oddballs', who are on a road trip in search of a lost friend, Fanny. The comedy thriller is slated to hit theatres on 12 September, which will be released in Hindi and English. The film's trailer has been receiving overwhelming response with over four million viewers since the day it was uploaded on the video-sharing website, YouTube. Check the trailer here. The film produced by Saif Ali Khan's Illuminati Films and Fox Star Studios, presents all the actors in a never seen before looks, thus making it a must watch movie. Check out some pictures during the launch of the first song "Fanny Re" on 11 August.